You will probably like this game if you like Galaga. 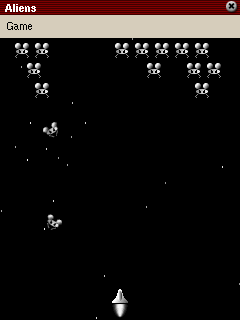 Aliens is a simple action game based roughly on the old Galaga idea. In the game you have a space ship and have to shoot down wave after wave of attacking alien space ships. The space ships shoot at you and move towards you. If you are hit you loose a ship until the game is over. The game shows some of the catching addictive game play of the Galaga type games. However, the Alien version is too simple in graphics and game play. All levels are identical, except for the increased difficulty of the next alien wave. Therefore, nothing really keeps you playing. Furthermore, the game is relatively easy to play if you got the idea. The lacking highscore list prevents you from having a goal to play for. Nevertheless, the game is not all bad. It definitely has a good handling on the Zaurus and is easy to play. The graphics is simple but not bad. So it definitely can be played for a game or two, especially as it is free.